for serving: use any dipping sauces you desire or can find at your local grocery store! • in a bowl, marinate the flank steak with the Sriracha, soy sauce and oil for about 2 hours (you can cut down on this time if needed). once marinated cook in a pan on medium heat. cooking on each side for about 2- 3 minutes or until browned. cover with foil, let sit for about 10 minutes and cut into thin strips and set aside. 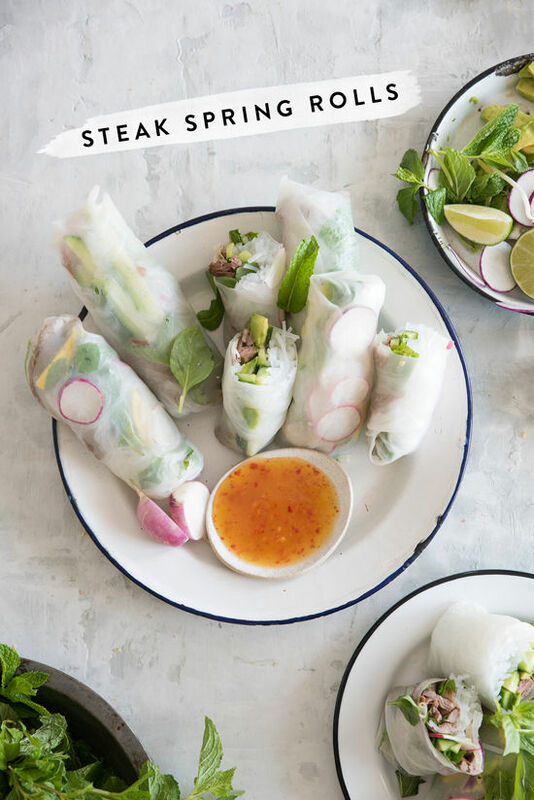 • in a sauce pan bring water to a boil and cook the glass noodles for 5-6 minutes. drain and rinse with cold water. 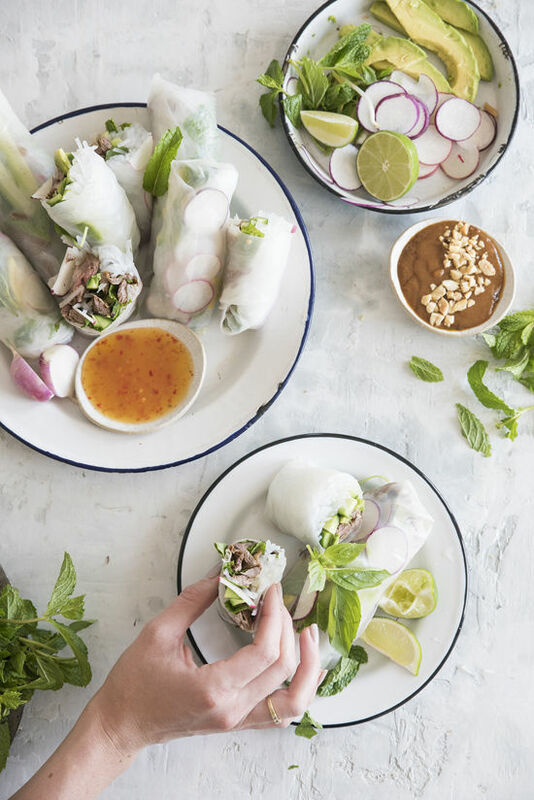 • on a dry clean surface lay out your ingredients to assemble your spring rolls. 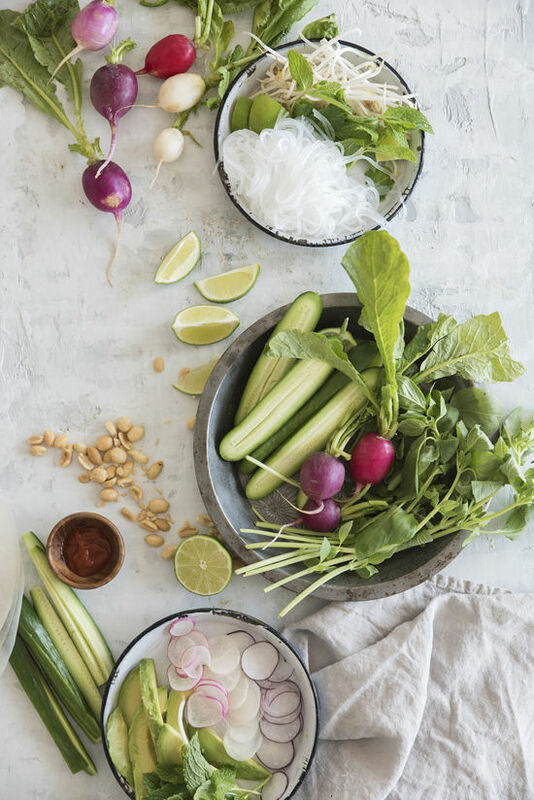 the sliced avocado, glass noodles, basil, mint, cucumbers, radishes. have a large bowl of warm water for the rice paper. 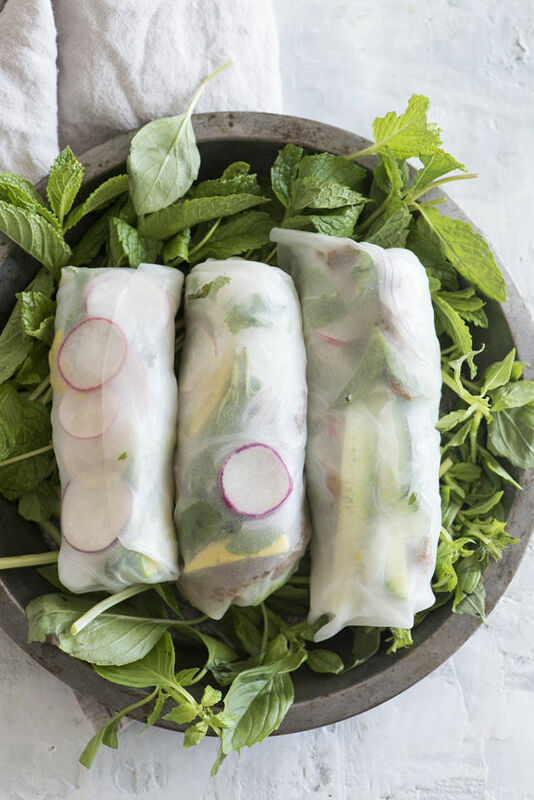 submerge the rice paper until it has softened, about 30 – 90 seconds. remove from the water and lay on the dry surface. layer with the ingredients in the middle and fold over each side longways first and then the ends. 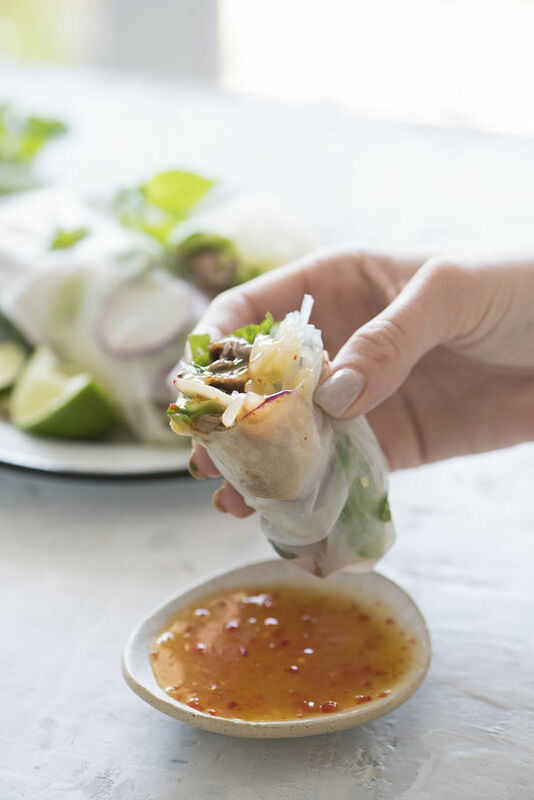 cut the rolls in half and dip with your favorite peanut sauce. we also served ours with a sweet habanero sauce as an option. i’ve found that if i soak the paper too long it ends up breaking apart. try only soaking it for 30 seconds, it will still feel slightly stiff but it will continue to soften. we’ve used two different brands from our local asian market and both worked great. also, make sure you don’t fill them too much! Yum Yum! These look so good! 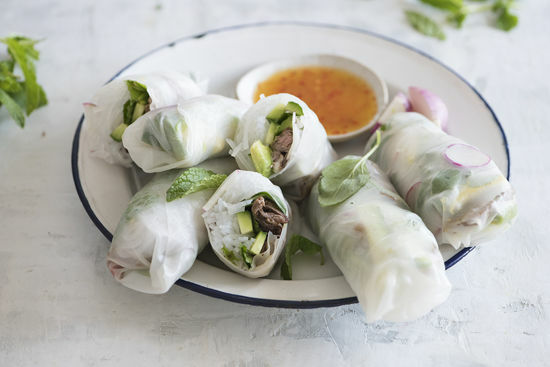 We make spring rolls all the time, but never put steak in them! 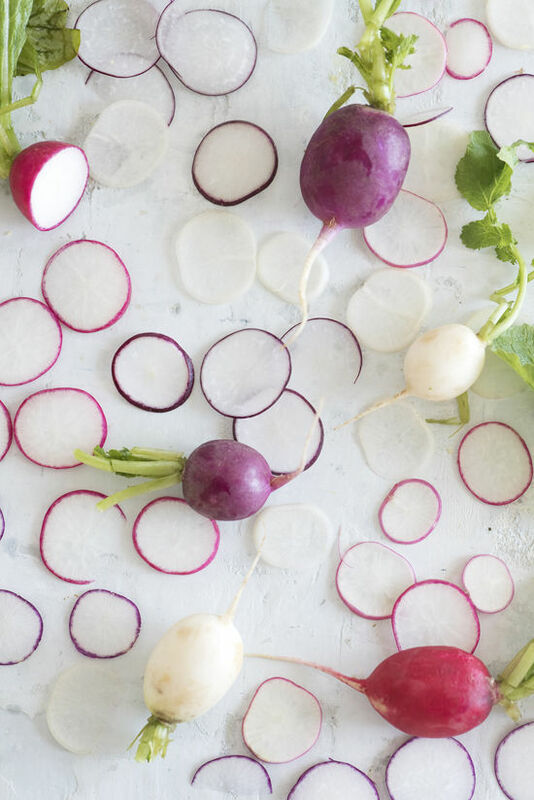 I also LOVE radishes, so DOUBLE YUM! I always love your food images, everything looks so fresh and bright!